The Marshall's iora (Aegithina nigrolutea) belongs to the family of ioras, Aegithinidae. The Marshall's iora species are distributed in India and Sri Lanka. These iora species are small brightly colored passerine birds. These ioras are monotypic species. The Marshall's iora (Aegithina nigrolutea) is a small-sized iora, measuring 12 to 13 cm in length and weighing 10 to 14 grams. The ioras in south India and Sri Lanka are slightly smaller in size than the northern birds. The adult male has golden yellow chin and throat and a variable amount of black on the upperparts and wings. The underparts are yellow. The adult females have entirely green upperparts and yellow underparts. The tail is black and white. The bill is straight, pointed and pale gray. The irises are blackish in males and yellow in females. The feet are gray. Their call is a fast, repeated "chi..chi..chi..chi..chi" sound. These Marshall's iora species are distributed in west, central and south India and Sri Lanka. 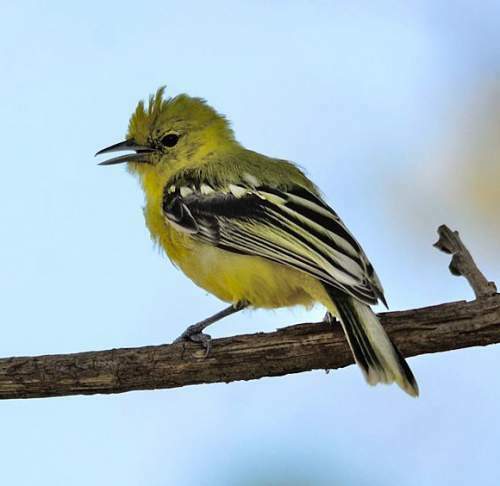 In India, these iora species are distributed in the states of Gujarat, Madhya Pradesh, Rajasthan, Chhattisgarh, Odisha, Jharkhand, Uttar Pradesh, Haryana, Punjab, Himachal Pradesh and Tamil Nadu. In Sri Lanka, these species are distributed in the tea country, hills of Nuwara Eliya District of central Sri Lanka including Horton Plains National Park. These Marshall's iora species do not normally occur in forest. These species normally occur in altitudes from 0 to 2000 meters. The artificial ecosystems and habitats of these species include plantations, rural gardens, urban parks and heavily degraded tropical and subtropical forests. The natural ecosystems of these Marshall's iora species include tropical and subtropical moist lowland forests, moist montane forests, open wooded country, dry grasslands, deciduous forests and dry savanna. The diet of Marshall's iora consists mainly of insects. Beetles, cicadas, crickets, grasshoppers, mantids, moths, termites, spiders and insect imagoes and larvae are their primary food. They glean insects from foliage and also from trunks and branches of trees. In rare occasions, they hawk flying insects. The breeding season of the Marshall's iora species is during June and July in northwest India. The laying season in rest of their range is not known. The males make courtship displays by darting up into the air, fluffing up all feathers and spiralling down to the perch. These species are monogamous. The breeding pair build a compact, shallow cup-shaped nest on a fork of a tree. The nest is a shallow saucer of interwoven grass, cobwebs and fibres. The typical clutch contains two to four pale eggs with dark speckles. Both parents incubate the eggs. Both parents brood the chicks and also feed them. These Marshall's iora species are non-migratory resident birds. The global population size of the Marshall's iora (Aegithina nigrolutea) has not been quantified. The overall population trend of these species is unknown. Throughout its range this iora species is reported to be common. The generation length is 4.8 years. Its distribution size is about 2,370,000 sq.km. Degradation of habitats is the main threat that may endanger the survival of these species. 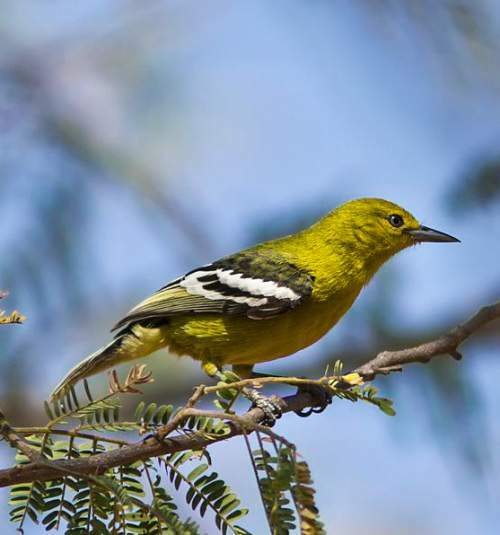 The Marshall's iora (Aegithina nigrolutea) does not approach the thresholds for being Vulnerable under the range size criterion or under the population trend criterion, or under the population size criterion. The CITES (Convention on International Trade in Endangered Species of Wild Fauna and Flora) status is ‘Not Evaluated’ for Marshall's iora (Aegithina nigrolutea). 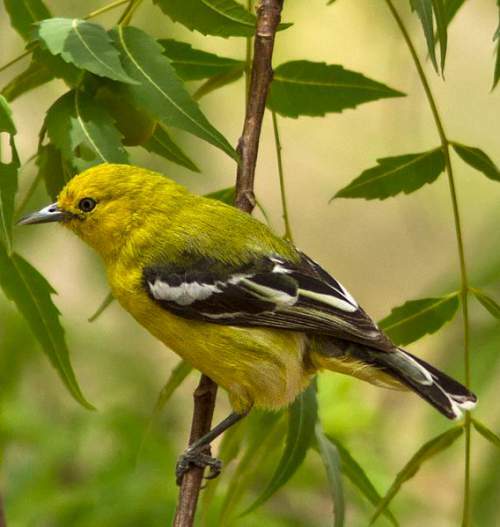 The Marshall's iora (Aegithina nigrolutea) is closely related to the common iora (Aegithina tiphia). Current topic in Birds of India: Marshall's iora - Aegithina nigrolutea.